Coral bleaching events can cause severe and widespread ecological damage with serious consequences for reef-based communities and industries. While the causes of coral bleaching are beyond the direct influence of local management, reef managers have important roles to play before, during and after bleaching events. Bleaching events can develop suddenly, with little time for preparation and mounting a response. Bleaching response plans are an important tool for ensuring reef managers are ready and able to respond appropriately to coral bleaching events. 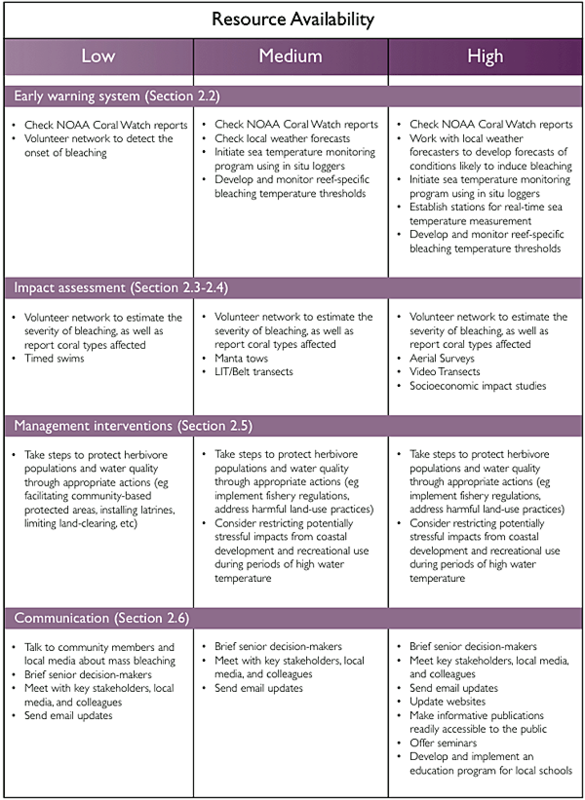 A bleaching response plan describes the steps for detecting, assessing, and responding to bleaching events. It enables managers to be ready should a bleaching event occur. This can be important for the way the incident is portrayed in the media, for ensuring credibility with stakeholders, and to prepare for appropriate management actions. Bleaching response plans commonly have a combination of routine and responsive tasks; responsive tasks are implemented when certain thresholds or triggers are reached. Bleaching response plans can take many forms, from a complete management response framework (e.g., Great Barrier Reef Marine Park Authority’s Incidence Response System) including an incident control system and field procedures to a simple one-page description of key steps and triggers. The four main elements of a bleaching response plan are: 1) an early warning system; 2) impact assessment; 3) management interventions; and 4) communications. This table provides examples of the types of activities that could be implemented under each element for three different resource/capacity scenarios (low, medium, and high resource availability). Once a reef has been affected by a coral bleaching event, managers might wish to consider local management interventions or restoration strategies to support recovery processes. However, coral bleaching events often occur at spatial scales of tens to hundreds of kilometers, making restoration an expensive and difficult – if not impossible – prospect.